Alright! Would you prefer rose clay flower in full bloom or bud? In this tutorial you'll find simple steps to make rosebud without cutter. But if you prefer full bloom rose you can have it by continue adding the petals to the center of the bud. Air dry clay like cold porcelain clay (any color as you like). You can make this clay at home with our homemade clay recipe, buy Japanese cold porcelain or soft clay as recommended at what clay to buy page. Make seven teardrop shapes. Start by kneading the clay and make a ball shape with diameter about 1-inch. Keep rolling the ball shape and form a teardrop afterward. You might want to check out our clay basic shapes page if you are not sure. Also roll 3 to 5 smaller ball shapes in green color for calyx and then to teardrop shapes. Pull the sharper edge of the teardrop and flatten this teardrop clay shape on your palm with your index finger. You might have different thickness or length of flatten teardrops. That's okay. Start making the petals by putting your pink (or other colors) teardrop clay on your palm. Use your thumb to press the clay to form petal shape. Do the same thing for all 7 teardrops. Take your first petal, roll it from one side to the other side to form the center of the bud. Leave the end of the petal open. Slip in the second petal from the open side and wrap it around the center. Get the third petal and wrap it around the second petal. Try to keep the petal's height even. Continue wrapping the remaining petals. After attaching each petal to the bottom part of flower, pinch the petal form flower base. 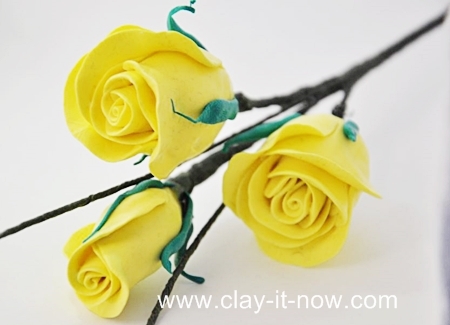 When you have done wrapping the seven petals, cut the excess clay at the bottom part of flower. You can now attach the calyx leave. 3 or calyx leave would be sufficient for the bud. If you prefer open rose, prepare about 13 to 15 petals instead of 7 petals. Attach all petals to the center of the bud by overlapping each petal halfway point of previous one. You've done with your rose clay flower now. This flower is best for boutonniere, brooch, hair accessories or home decorations. Recently we've received many emails asking if we could make rose tutorial with no-bake salt dough because the rose they make crumble when it's dry. So please visit our rose salt dough page if you want to know more. We've also done our video tutorial as below.